Association, his dedication to education through music, and his philanthropy as Founder and Executive Director of Local United Network to Combat Hunger, which produces benefit concerts and drama events. 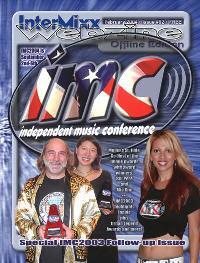 The exact text of the award reads "In recognition of the musician or industry professional whose philanthropy, promotion, dedication and talent has done the most to advance the cause of Independent Music scene and its ideals in 2003." The Independent Music Conference brings together independent artists and music professionals from across the country to help develop and support the growth of new music and new artists not affiliated with major labels.